A soldier meets a mysterious stranger in a graveyard. Could this be the dark figure that townsfolk have seen darting in and out of the shadows? Would you decorate your Christmas tree with spider webs? Learn a wacky Christmas fun fact as you reflect on holiday traditions. Read Vasilisa the Brave, one of Russia's most famous folk tales, with your child this Halloween, then help her answer the comprehension questions at the end. Read this version of The Wild Hunt with your little boy or ghoul this Halloween, then answer the comprehension questions at the end. In this reading worksheet, just in time for Halloween, kids can read all about Fred Fisher, the star of Australia's most famous ghost story. How many similies can you find in this Christmas poem? Get into the holiday spirit with a holiday classic, "The Night Before Christmas"! Give your wild child this werewolf story to read this Halloween. He'll have a spooky story to share with friends, and get some reading practice, too! For October (or just for kids who love scary stories! ), here's a great telling of Bancho Sarayashiki, one of Japan's most famous ghost stories. Ready for Halloween? Here's Noppera Bo, a terrifying folk tale from Japan, to help you celebrate. 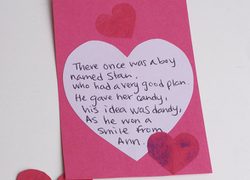 Help your third grader author a lovely limerick in honor of Valentine's Day! He'll be delighted to compose and recite this nonsensical poem.